Toddler Approved! : Crafts and Activities To Do Along With Ten Apples Up On Top! 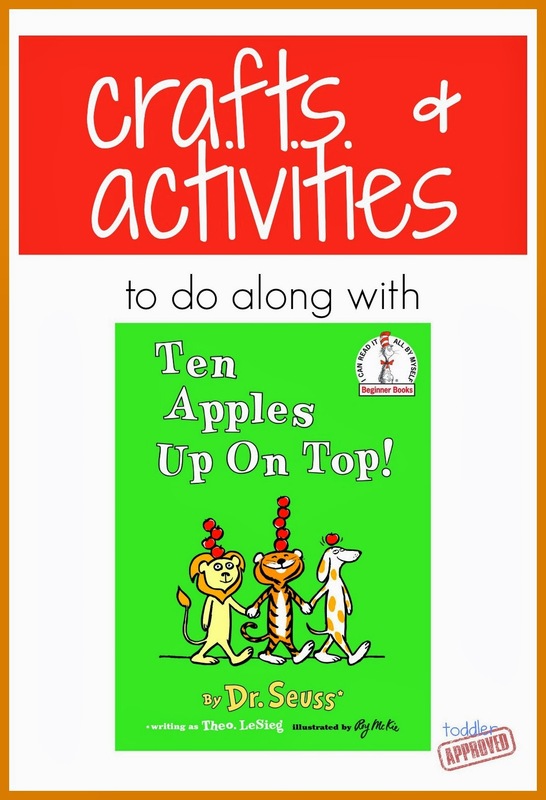 Crafts and Activities To Do Along With Ten Apples Up On Top! Dr. Seuss has a birthday next week and we are excited about it! 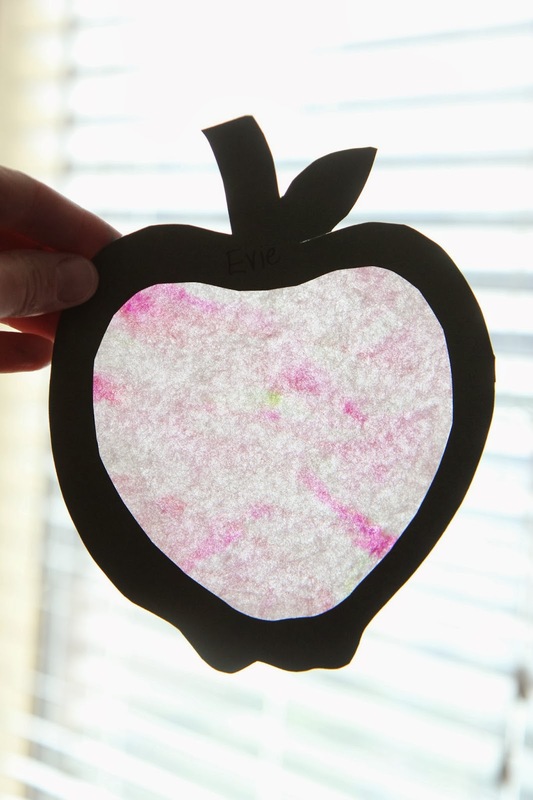 I am hosting our little preschool for the next four weeks so I thought I'd share some of the Ten Apples Up On Top book inspired crafts and activities we did this week. Next week we will be focusing on a different Dr. Seuss book. Which one would you pick? We started off preschool by making coffee filter apple suncatchers. You can find the entire tutorial over on Mom to 2 Posh Lil Divas. Instead of using spray bottles, we used eye droppers... including one of these twisty droppers from Learning Resources. The kids especially enjoyed the squirting water part. To start I drew a really rough picture of the lion from the book at the bottom of a piece of paper. Then I drew several apples (enough for each child to have one) on another piece of paper and cut them out. I colored them and wrote a different child's name on each apple. Once the apples were colored, I hid the apples around our living room and the kids got to hunt for the apple with their name on it. Once they found their name, they brought the apple over and matched it to the name written on my piece of paper. We stuck the apples to the picture using tape. 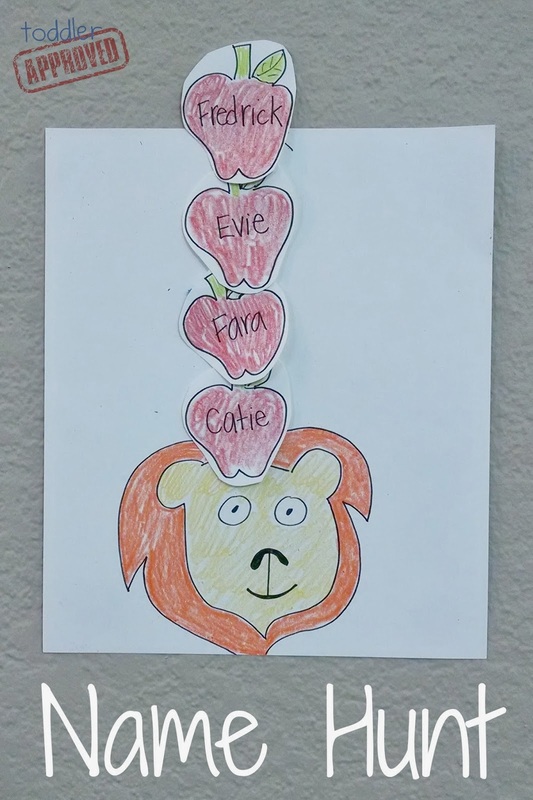 Once each apple was added, the lion had a stack of four apples on top! Each child was at a different stage with regards to recognizing their name so I helped remind them what letter their name started with. We also talked about the size of their names and the other letters in them. Some kids needed to look at the poster to see their name so that they knew what they were looking for... and some kids could already easily recognize their name. 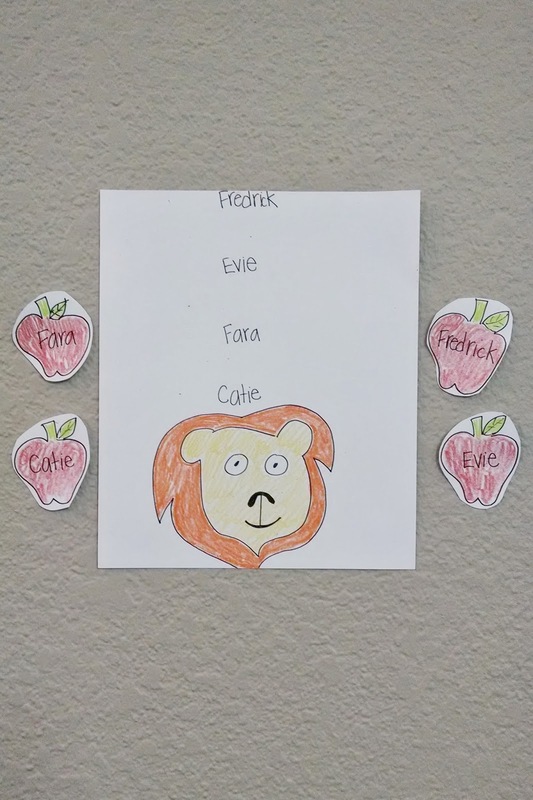 After we did our name hunt a few times, we read Ten Apples Up On Top and acted out various parts of the story. Next we did some apple printing! If you can believe it... my kids have never done apple printing before. We tried using corn on the cob skewers to help us grip the apples better and I loved it. Occasionally the skewers would pop out so I would need to stick them back in for the kids. I definitely would only use them with kids who could use them responsibly and with full adult supervision. My little students were so fascinated by the printing part with all of the paint that they didn't even think to goof around with the corn cob skewers. 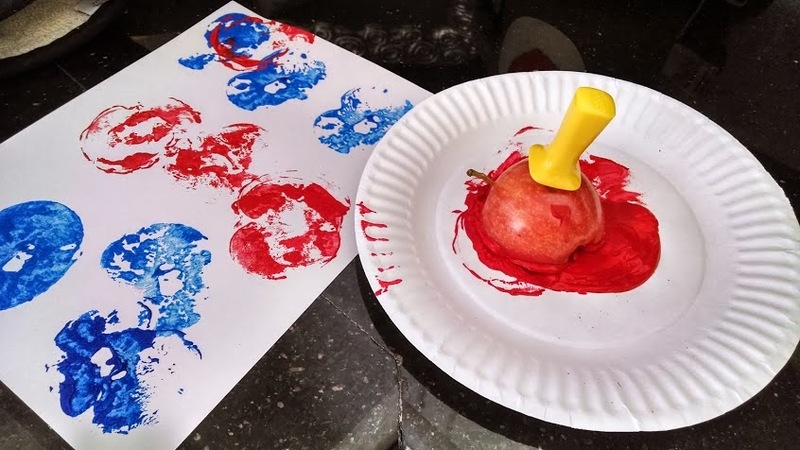 My friend Etta shared this other great way to cut apples so that they are easier for the little ones to use them as they stamp. Apple printing is just plain fun. The kids learned about shapes and colors as they printed with the apples. We also talked a little bit about pressure and how it effects how much paint ends up on the paper. It was cool to see how they also practiced problem solving as they were printing to try and get each part of the apple to print and make a cool mark. Some kids covered their entire paper with paint and some just left a few marks. 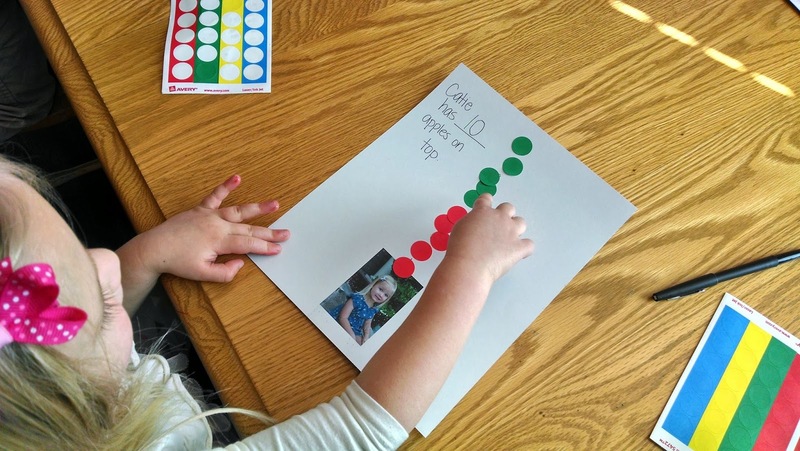 Next we did a simple Ten Apples Up On Top sticker activity. I do sticker activities for a few reasons. The main reason is that the majority of kids love stickers and they think sticker activities are a whole lot of fun. Although I love to tie a learning element into many of our activities, sometimes it is ok to just do an activity because it is fun. The other main reason I do sticker activities is because stickers are great for strengthening finger muscles and developing fine motor skills. As kids learn to pull stickers away from their backings they strengthen their finger muscles and as they stick the stickers in place they also work on building their fine motor skills. Teach Preschool shares several other great information about fine motor play and why it is important. To create this activity I printed off a photo of each child at the bottom of the paper. Then I added numbers one through ten on top of their heads so that the kids could make 10 apples on top of themselves! 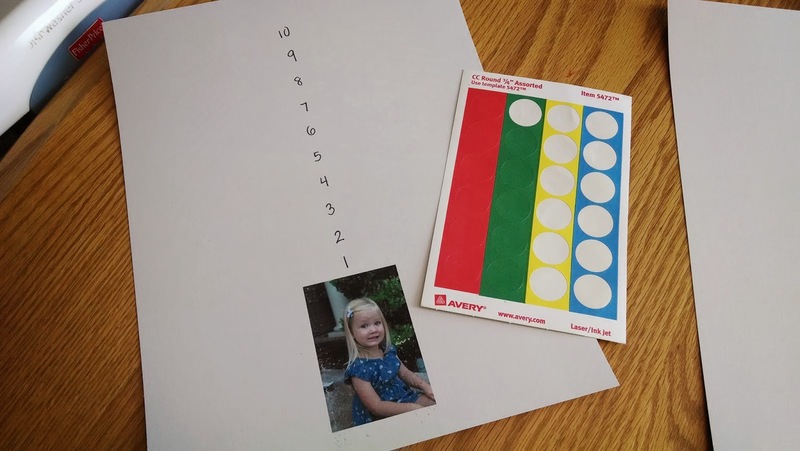 As we got started with this activity my goal was for each child to practice counting numbers 1-10, learn to name and identify a few of the numbers, and practice matching one sticker to each number. I gave each child a sheet of dot stickers with four colors on them. In my mind I wanted each of them to only use red... and maybe green and that was it. I was sure glad that I forgot to tell them that. Instead of just sticking the stickers onto the numbers and being done, the kids explored the colored stickers, they talked about their favorite colors and how they wanted to have yellow or blue apples on top of their heads too. Some kids counted each number before they added the stickers and then carefully covered each number to make exactly 10 apples on top of their photos. Some kids decided that they wanted to have more than 10 apples on top of their heads, so they added 12 or 13 apples. Some kids decided that they wanted to explore color patterns and added one or two reds, then a green sticker, and then a yellow one and then another red one. Not only was this activity a wonderful way to develop fine motor skills, there were also language skills that were cultivated as they explored the stickers. We discussed the concepts of over, under, on top, and next to. The also kids practiced making observations as they commented on other pictures and noticed that some friends had more or less apples on top than they had. The simple counting sticker activity that I had originally planned turned into much more than that. 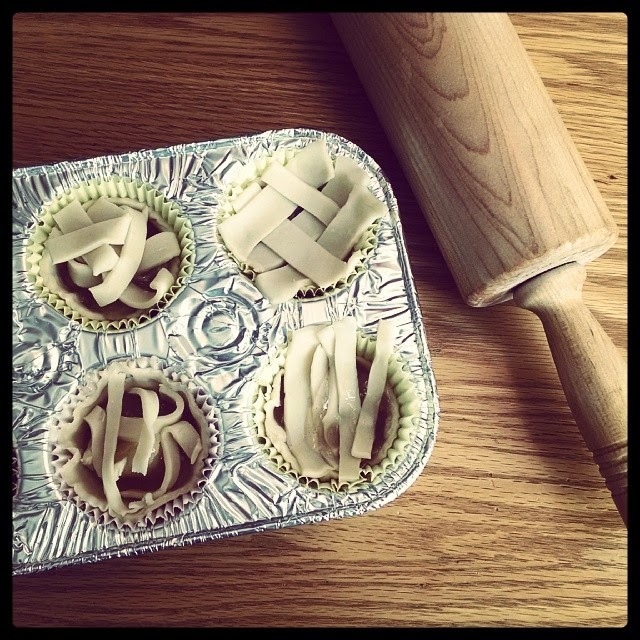 Our last activity of the day was to make easy mini apple pies with the kids. I kept this activity super easy by buying pie crust and apple pie filling because I knew we wouldn't have that much time and because I am new to pie making. Send me a good pie crust recipe if you have one! The kids got to roll out the dough, press it into the muffin tin liners, scoop the apples into the muffin tins, and then cover the mini pies with extra dough... attempting to make a lattice. I baked them at 425 for 10 minutes and probably overcooked them. I don't love apple pie, but the mini pies turned out really good. We will be making them again. The kids thought it was so neat to get to make their own pies just like their parents do. 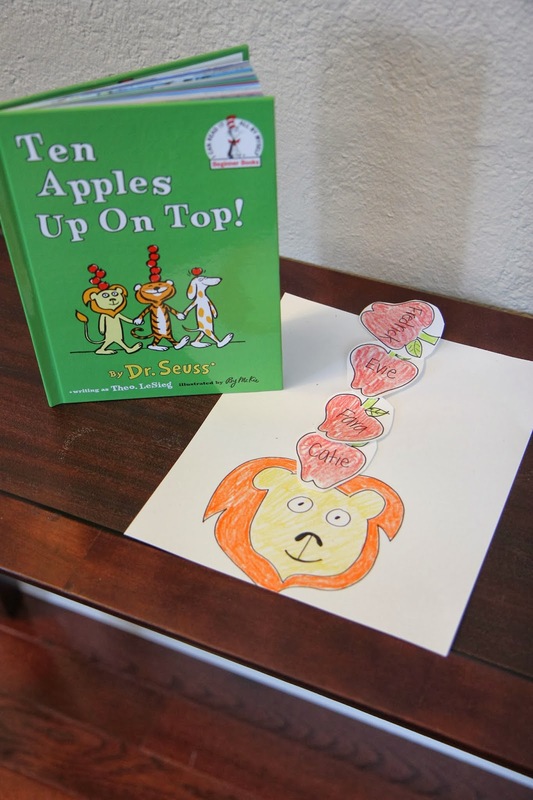 I am collecting more Ten Apples Up On Top and Dr. Seuss activities on my Dr. Seuss for preschool pinterest board if you want to follow along and get more ideas for your little ones. Fabulous ideas! You are so brave to bake with the students; what a wonderful experience! Mahalo for sharing. Our household loves your activities! As for a pie crust, try Smitten Kitchen's all butter crust. My 5 year old loves making it with me.